Short sentence about yourself (family, education, etc): For the industry, I am proud to say that I followed dad in his footsteps of being President of all nursery industry associations that there are, from St. Louis, Missouri State, 6 state and National associations! Some of them I did twice!! I still stay very connected to stay on top of trends, regulations, and education. Locally I have served on the SFB School board and Parish Council for 12 years, the City Chamber for 12 years, and am still involved on committees of the Chamber. As a company and personal we/I stay involved and committed to Downtown Washington as well. I am happily married to Tim since 1978. We have a fantastic daughter, Abbey, who has married Eric, and blessed us with three beautiful grandchildren, Anna, Noah, and Gabrielle. I am the oldest of six siblings (that I love) and I work with three of them, Sheri, Chris, and Scott. The other two, BJ and Karen, work outside of the company. Favorite Plant/Flower: WOW too hard! In my flower beds it is Dragon Wing Begonias. In my house it is Anthirum, orchids, and Paperwhite bulbs. Worked here since what year? Full time since 1985, but have been with the Nursery my whole life. I grew up in the house literally on the property. I graduated from SFBRHS in 1993 and studied Horticulture at East Central College. Short sentence about yourself (family, education, etc. I am the father of 3 awesome children, Nathaniel, Ethan, and Mya. My awesome wife, Gail, who holds it all together. Seriously! What a job! My hobbies include the outdoors, fishing, baseball, basketball, volleyball, and fast pitch softball. Favorite Plant/Flower: My favorite plant is “October Glory”, Red Maple Tree. My favorite flower is the Red Geranium. Short sentence about yourself (family, education, etc. Mother of two beautiful daughters, and grandmother of 3 amazing grandchildren. Favorite Plant/Flower: Chris loves all plants and flowers! Short sentence about yourself (family, education, etc. Annette is the mother of three adult children, a graduate of Hickey School, and a resident of Washington, MO. since 1988. Short sentence about yourself (family, education, etc. I have four great kids who I love spending time with. We enjoy going to church and spending time outside doing just about any activity. Short sentence about yourself (family, education, etc. 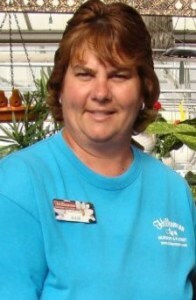 I have been in the Nursery landscape business for over 22 years. Outdoors, gardening, and animals have always been part of my life. I was raised on a farm in Montana and moved to Missouri in the late 70’s. My husband and I live on a small farm where we have raised three children and are blessed with 14 grand-kids…enjoying life to the fullest! Short sentence about yourself (family, education, etc. Happily married for 6 years and just had our first child! Short sentence about yourself (family, education, etc. Born and raised in Washington, MO. Took art and basic classes at East Central College. Left college for an art position. I have many years of graphic art work experience. I’m now residing in Washington with husband, Clarence, and daughter, Emilie. I enjoy photography, swimming, walking, biking, and area trails. Favorite Plant/Flower: Favorite plants are native redbud, dogwood, and serviceberry trees. Short sentence about yourself (family, education, etc. I have two beautiful daughters, four cats, and one dog. I graduated from Pacific High School in 1977. Favorite Plant/Flower: Rose is my favorite flower. It was my mother’s name, who is no longer with us. Short sentence about yourself (family, education, etc. Julie has her horticulture degree from East Central College, is married, and has two daughters whom she loves spending time with. Short sentence about yourself (family, education, etc. I have one younger sister and two step-brothers. I live with my best friend and we have a cat named Casper, a rabbit named Houdini, and a bearded dragon named Izzy. I graduated High School, went to Mizzou, and I am a certified Health Coach. My future plans are to obtain a Botany degree. Favorite Plant/Flower: All Plants! But my favorite plant is a tropical ferius and favorite flower is orchids.